The Heads of State or Government agreed that bold moves were needed to close down people smuggling routes, to break up the business model of the smugglers, to protect our external borders and to end the migration crisis in Europe. We need to break the link between getting in a boat and getting settlement in Europe. It’s as if the flow of refugees were invisible until rubber boats materialized in a magical, wavy mirage on the Turkish coast. There have been a lot of good articles which explain the details of this deal, so I won’t repeat that here. The Guardian has a Q&A page that explains the agreement, and Matthias Krupa’s piece at ZEIT ONLINE does a good job of pragmatically assessing the consequences in German politics here. The criticism of this deal has also proliferated: see the remarks of the UN Human Rights Chief, Zeid Ra’ad Al Hussein in English and in German. UN Human Rights Chief Hussein has been speaking out against inhuman treatment of refugees throughout the crisis. Back in February 2016, he expressed serious concern about the shifts in policing taking place in Austria, Croatia, Macedonia, Servia and Slovenia as these countries tried to limit entry to refugees crossing through their territory. He also accused these countries of “exacerbating ‘the chaos and misery all down the line’ and especially in Greece.” What is a consistent argument against the plan is that this deal could break with the Geneva Convention and international human rights law – supposedly the bedrock of the European Union and protection against repeating the genocide of the Second World War. 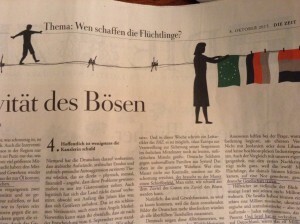 Günter Burkhardt, leader of ProAsyl (a German working group) wrote a strongly worded critique for the Frankfurter Rundschau pointing out that this deal also creates a heirarchy amongst those seeking refuge – placing Syrians above all other nationalities rather than hearing individual reasons for flight. ProAsyl is supporting refugees in Greece who want to press charges in court to have their cases heard. While Greece – rightly so – figures prominently in the EU Heads of State plan, there is no discussion of the bloodshed and chaos causing people to flee. Furthermore, Turkey is – step-by-step, with each suicide bomber or crackdown on the freedom of the press – becoming more and more instable and autocratic. Even Horst Seehofer, right wing politician of the CSU, rejects the deal because of the concessions it makes to Turkey. 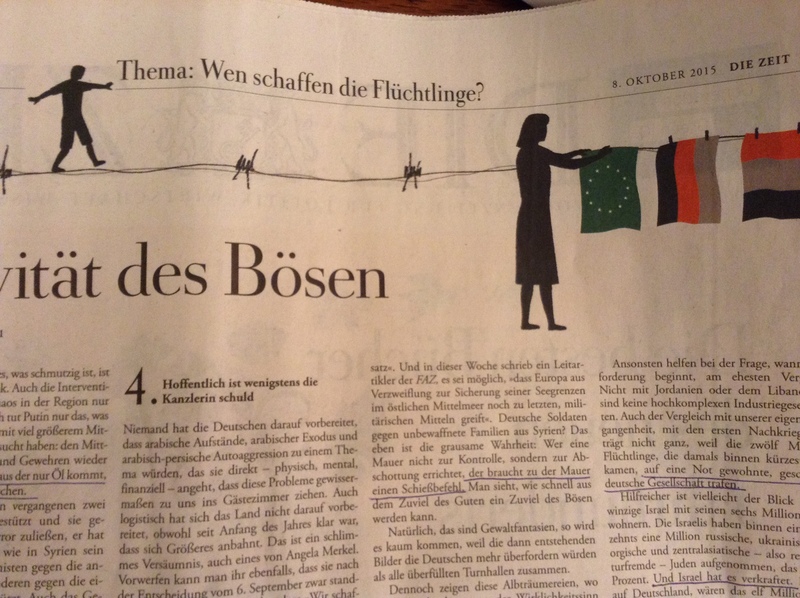 Back in November 2015, Thomas Assheuer wrote a visionary op-ed for Die Zeit called Our Culture of Welcoming (Unsere Wilkommenskultur). What will be written in the history books about these days in October? Maybe “Europe’s Failure”? Temperatures are falling to freezing, and in Europe, thousands of refugees are sleeping outside, in the mud and cold, among them infants and children. The refugee is what remains after the destruction of political spaces: he is life laid bare in flight [das nackte Leben auf der Flucht]. You don’t need a lot of imagination to sketch out what happens when the flow of reguees doesn’t end, when cities and communities capitulate to the number of those seeking protection and the EU makes a solvable problem into an unsolveable one. What will happen – as the recent successes of the AfD show – is that the political spectrum will jump to the right and Merkel (center right) “will suddenly stand there as a left-liberal European.” Assheuer predicts the return of authoritarian states 25 years after the Fall of the Berlin Wall: and the special forces soldiers from back then, he jokes, are still available for employment. The Turkey-EU deal is evidence of Europe making a “solveable problem into an unsolveable one.” If member states had agreed to a distribution plan earlier, the pressure on Greece and other large receiving countries – like Germany and Sweden – would be less. One by one, European heads of state – the Faymanns and the Orbans – have clung to nationalist fantasies and left Merkel isolated as the only humanitarian. That position, Malte Lehming commented in Der Tagesspiegel – is one Merkel is slowly giving up. She has been pulled to the right, and perhaps supports the deal with Turkey not just because it was her idea, but because in this political climate, it may be the only alternative. In Vienna yesterday, there were protests against the deal.